Yoga for Better Bones is the book for Yoga practitioners and teachers who want to practice yoga for osteoporosis safely and ensure that they do no harm through their practice of Yoga. The updated Second Edition of Yoga for Better Bones is available in both print and Kindle formats for purchase on Amazon. You will learn how to protect your bones, as well as modifications to Yoga poses to make them safer for someone with osteoporosis, osteopenia or low bone density. The book also identifies Yoga poses that would best be avoided. This book is a must for yoga practitioners and teachers who practice yoga for osteoporosis and want to make sure that their yoga poses are safe for someone with osteoporosis, osteopenia, or low bone density. The book shows how to modify popular yoga poses that potentially put your bones at risk of fracture. Richly illustrated with clear photos and images, this comprehensive book describes your anatomy and movements as they relate to Yoga, provides detailed guidelines on how to have a bone friendly Yoga practice, and describes, in detail with photos, the modifications required to make popular Yoga poses safer for someone with osteoporosis. 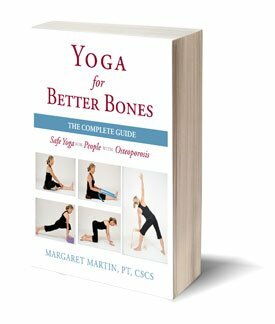 Yoga for Better Bones was written by Margaret Martin – a Physical Therapist, licensed in California and Ontario, with over 30 years of experience helping people like you achieve their health and fitness goals. Margaret is a Certified Yoga Teacher and Certified Strength and Conditioning Specialist (CSCS). She is the recipient of the 2011 Award of Distinction from the College of Physiotherapists of Ontario for her achievements and significant contributions to Physiotherapy. 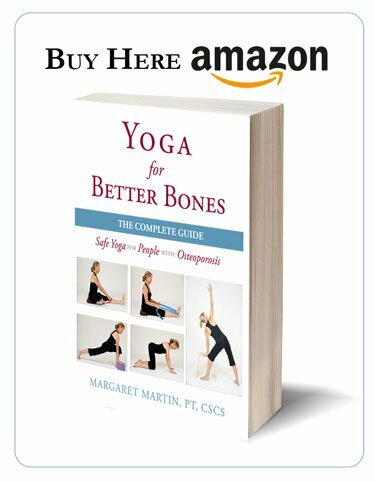 Margaret is the author of Exercise for Better Bones, Strengthen Your Core, and Yoga for Better Bones. She produced the safe exercise video, Stronger Bones, Stronger Body. She also has developed two online courses for health and fitness professionals, Working with Osteoporosis and Osteopenia and Building a Stronger Core. Her Physiotherapy studio is located in Ottawa. Yoga for Better Bones in both print and Kindle formats is available for purchase at Amazon. If you practice yoga for osteoporosis and are a Yoga practitioner with osteoporosis, osteopenia or low bone density, I have five valuable, bone-healthy tips for you. I specifically cover finding the right Yoga studio and Yoga teacher. These are based on tips provided by a fellow Physical Therapist and Yoga instructor, Matthew J. Taylor. So, first tip is the school that you select should specifically ask you to complete a health history, and that health history should include health questions about your bone health. Two, your health history isn’t going to help anybody if it’s just tucked away. Make sure that the teacher or teachers that you choose to practice with review your health history. And one extra thing that Matthew didn’t mention, but make sure that that teacher understands what osteoporosis means. This is really critical. I studied my yoga teacher training in the capital of Canada, and my yoga teacher was very well recognized within the city of Ottawa. And even her instructor that came in from the States was also very well recognized in her state. But both of them when I questioned them about their knowledge about osteoporosis confidently said, “Oh, totally understand osteoporosis,” and then went on to describe to me, osteoarthritis — two very different conditions with very different contraindications and precautions. So, ensure that you are practicing under the guidance of someone who understands your condition. Tip number three, is the postures when they’re taught in the class should be given to you with detailed instructions. Props should be suggested, and precautions made based on your restrictions and limitations regarding your bone health. Four, your teacher should be circulating and be giving you verbal and light touch corrections. Five, students should be encouraged to ask questions. The class should be encouraged to be comfortable in all their postures, and control should be emphasized. This is especially true with balanced postures. So, those are the five key tips on choosing the right studio and a safe teacher for you to practice your yoga. And one more really important tip that I have to share with you today, is if you do practice yoga and you have not yet purchased Yoga for Better Bones, I have a new edition out that talks about some of the recent studies supporting yoga and bone health. Yoga for Better Bones is one of my products.